This 4.3 acre property was purchased by the American Legion in June of 2006. The house that was on this property was donated to the Parma Fire Department for a “controlled burn” training. 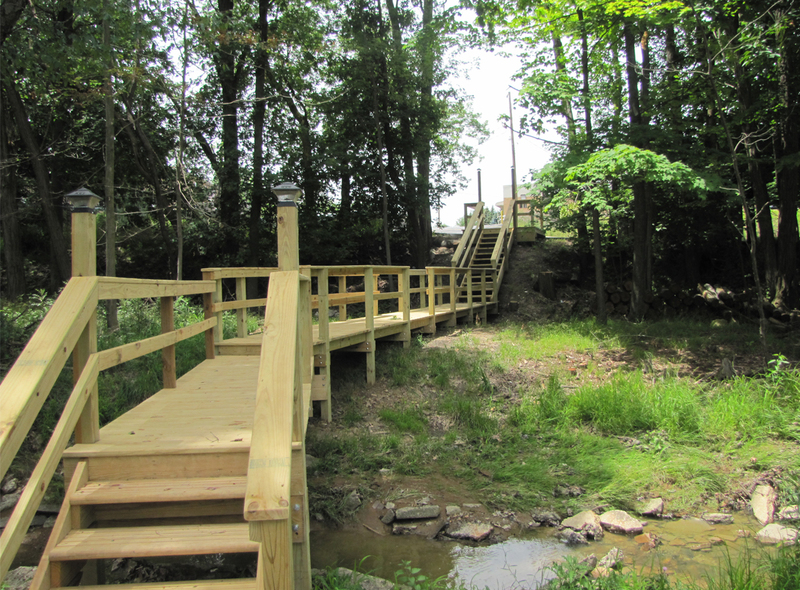 In 2013 the idea arose to build a bridge to the property so that people could enjoy the beautiful, 5-acre wooded lot. The land also contains 650 linear feet of primary headwater stream, and a large riparian area with a fully functioning flood plain. West Creek Conservancy came to an agreement with Post 572 to place a 4 acre conservation easement on the land, and the headwater stream at the end of 2014. In May of 2015, a bridge that had an estimated worth of just over $30,000 was installed. This bridge featured an 8×8 lookout deck, 2 steps, 50 ft. boardwalk, and a 20 ft. bridge. The organizations that donated the materials and helped secure funds were (in no particular order): West Creek Conservancy, Kohls Associates in Action, Creeklife.com, Axelrod Buick GMC, iLocalEverywhere.com, Emma Thorne, mKreative, and Peter Bode. This project is being featured on the City of Cleveland’s office of sustainability’s “Year of Clean Water” video series. Post 572 is, and will continue to be, a leader in connecting veterans, the community, and the environment.